Jamie Statema of the vocal group, Go Fish, knows first-hand the power of popular music to reach a young life with an ancient but continually vital message. It happened to him as a sixth grader, when a performance by the band Found Free led him to devote himself to Jesus Christ. Over four albums dating back to the 100,000-plus selling Infectious in 2001, Statema has led Go Fish, as they built an infectious catalogue of vocal-centered music that merrily point the way toward salvation. The band's name derives from a Bible passage wherein Jesus declares that some of his disciples who were fisherman will now fish for souls. On Splash, the vocal trio's first album for their own Go Fish Kids Records, Statema, Jason Folkmann and Andy Selness have outdone themselves. The album is their first to specifically target children, and a return to basics of sorts after trying a more elaborate sound on the Parade album in 2003. Splash brings back the strong vocal harmonies that drew such a large fan base to the group and this time the project was produced by all three members of Go Fish and Darren Rust. "A lot of people have a hard time believing we can create our sound with just a cappella voices and percussion," said Statema, who started his musical life as a drummer. "It makes for a happy sound. It's hip enough to where it's culturally relevant, yet there are no guitars to freak grandma and grandpa out. So, yes this is our first full-on children's album, but the audience has been so accepting of Splash that it has made our fan base broader than ever! A blend of doo-wop, gentle hip-hop, sing-along choruses and farm animal sound effects thrown in just for fun, Splash gives kids of all ages a bit of comfort and subtle instruction balanced with large dollops of tongue-in-cheek humor, as on the song, My Very Own Church. "If I had a church this is what I'd do/I'd put a pop machine in the back of every pew/And we would only sing songs that were picked by me/And we would get out just in time to watch football on TV." Other songs on Splash, written primarily by Statema, cleverly teach about the importance of the Bible ("The B-I-B-L-E"), working hard in school ("Planes, Phones & Microwaves") and the promise of heaven ("Alleluia"). And then sometimes things get giddy with fun ("The Moo Moo Song"), "I've got a cow down on the farm/Moo, Moo, Moo, Moo/She gives milk without alarm/Moo, Moo, Moo, Moo/One time she drank from a frozen stream/Moo, Moo, Moo, Moo/And ever since she's been givin' ice cream/Moo, Moo, Moo, Moo"
Statema formed Go Fish in the Twin Cities of Minnesota in 1993 because he knew he wanted to make music his career and wanted to do something different musically. "After attending a concert with two a cappella groups, The Blenders and the Nylons, I discovered the base of the sound I was looking for and added loops and beats so it could be my own brand of music. The goal was to make the one CD that people of all ages could agree to play in the car. Doing just vocals and percussion was the thing I thought would work and it's rewarding to see the concept become a successful reality." The group's lineup changed over the next few years, with Statema the only constant. 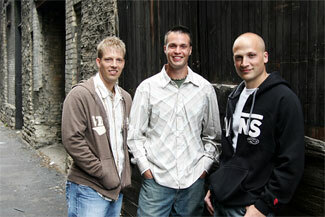 In 1996, Go Fish did a concert at Northwestern College in St. Paul, Minn. Folkmann and Selness were in the audience. "We had an a cappella group that had six members, and so naturally we wanted to see what this other group (Go Fish) was up to," Folkmann said. "We were probably the last out of the auditorium. They were really engaging with the audience. Andy and I just looked at each other in amazement." By Christmas of 1998, Go Fish was a trio featuring Statema, Folkmann and Selness. Statema does most of the songwriting and lead singing, while the Canadian Selness handles the low notes and Folkmann does the tenor vocals. "I grew up on a hog farm in Iowa, so I'll stick in an animal noise here and there," Folkmann said. "Kids are drawn in by being a little goofy and animated on stage. They get over any feelings that they have to act cool once I bust out with a sheep noise!" On Splash, Go Fish continues its tradition of independence. "We've been told time and again that we have to do two things to reach more people," said Folkmann, who got his start singing in church. "You have to have a full band and get on the radio. Well, we've never had a band and we haven't focused a lot of time catering to radio but we do know who Go Fish is and what makes us unique. We have stayed true to who we are and so far it's been working." With Splash, Go Fish has accomplished two seemingly contradictory goals. The album sharpens their focus on children, while it shapes up as their most accessible album for all ages. "I grew up with the children's ministry, and I have such a passion to reach kids at their most impressionable ages," said Selness, the son of a pastor who plays keyboards and guitar. "We can really have such a huge impact. The nice thing is there isn't any reason to dumb down anything musically because you want to reach kids. They're smart, and they appreciate it when they realize you're not talking down to them in any way. Their parents, and their grandparents, are just as smart. It's looking like they appreciate a little good-time fun, too."